Create the first object and position it wherever you want. As a leader object, it’s a base of all positions. The name of first object needs to include a space and number 1, such as “rectangle 1”. Then duplicate it and apply the expression below to the position property. Here’s a sample with a modified version of this expression. After all, a project file is worth a thousand words. So download it from the link below and play around with it! I would much appreciate it if you could give me a feedback. So please don’t hesitate to get in touch with me if you find some errors or better ways. I hope you develop the expression and create awesome motion graphics. Thanks for sharing Shinsuke. A really handy expression. Rather than relying on layer names perhaps a slightly more flexible version would be to use the power of the layer index command. Thank you for your feedback, Jason. Your expression is smart. I also use the index number of layer. But with layer names, it doesn’t depend on the stacking order of layers. So I use them separately in different situations. Anyway, your feedback is worth much for this series. So I kindly ask for your continued support. 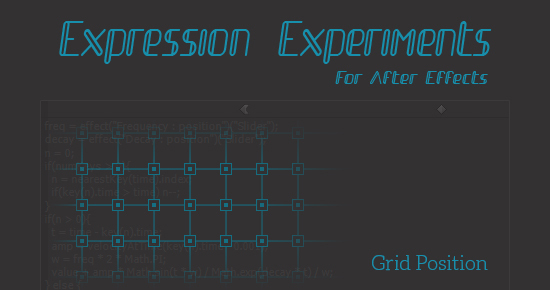 … where “grid controls” is my null control layer, and “number per rows” is the slider control. Probably obvious to you expression guys, but I’m new, and it felt good to figure it out! Thank you for your feedback, Thom. As you pointed out, it causes some expression errors if the value for the number of objects in a row is zero or with decimals. So if you set up a slider for the value, apply this expression for the slider property. “clamp” is a method that can limit the values. It’s so simple and handy! If you want more information about clamp, check out the link below. I hope this series help you even just a little. Inspiring expression and cool site! I have a problem regarding the download: I get a ZIP-File after the download and after extracting the ZIP with several unpackers i only got a *.cpgz-File which again contains a ZIP-File. Tried it on Mac and PC. I’d really love to see how you achieved the modified version in the project file. Could you explain that or check your File-Upload? Thank you for your kind words, Simon. And I’m sorry for the trouble. Could you try to download it and extract it again? Because it works for me. And if it doesn’t work for you, please get in touch with me again on my contact page. In that case, I’ll send you the file by attaching it to the email.